Skincerity in a permeable barrier mask that is worn overnight to help hydrate and firm skin, soften wrinkles, eliminate pigmentation or sun spots, help heal acne, ezema and dermatitis rashes and other skin aliments. It can be used on bug bites, rashes, stretch marks and other parts of the body. While it has gotten its acclaim in the beauty arena, you can use it anywhere you have skin! So think of it as an all-over skin treatment. It creates a breathable, antibacterial barrier that allows oxygen to penetrate the skin while hydrating the skin from the inside out. It helps maintain your own natural moisture in your skin to maintain plumpness and fullness. It helps to heal and repair newer scars and acne or pimples. It also will make any skincare product you are currently using work better by oxygenating that product so it is more effective. The barrier resists the oxidizing that can occur and diminish the effectiveness of a product that is exposed to the air. Cosmetic grade Acetone: which is necessary in creating the microscopic holes in the barrier mask, allowing it to receive oxygen from the environment. It also helps to ‘clean’ the oxygen, acting as an antibacterial agent. Two topical cosmetic grade Polymers: these create the actual barrier, which allow moisture retention. These polymers do not penetrate the dermis, merely stay on the surface and act as a permeable shield. Two anti-oxidents : Vitamin E and Grapeseed oil and Fragrance. Acetone! Isn't that what the use in nail polish remover? Skincerity uses a pharmaceutical grade acetone, which is specifically used in skin care and for topical application. It's not the same acetone that is used in nail polish remover. Think of it like alcohol. You might enjoy drinking vodka or rum or gin or whatever, but you would never consider drinking rubbing alcohol! It’s the same in this case. The acetone in Skincerity helps the polymers to maintain an antibacterial environment and give it fluidity (otherwise is would be a sticky, gooey mess!) which then allows your skin to replenish itself effectively. I don't see anything in the ingredients that suggest it's good for acne.While it is not an invasive repair product, it was originally designed to help patients in post skin cancer care and is specific to creating an environment to facilitate quick healing of any site being treated. In clinical and on site dermatology studies, the barrier mask allowed the effectiveness of the products used for post cancer care, to become more effective, thereby promoting faster healing and recovery. The same studies were done for acne treatment with positive results. Acne scarring and acne sites were diminished over time and the overall texture and condition of the skin was improved. Does it have a secret ingredient? Yes but its not in Skincerity. The secret ingredient is the moisture that's already present in your skin! 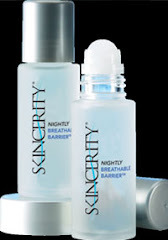 Skincerity helps to keep it in the many layers of the skin, throughout the night, so it can work its magic. Consider that you skin is constantly working to rejuvenate itself and while topical products aim to help by applying vitamins, antioxidants and moisturizers to the surface, you own body is supplying the same ingredients from inside. Unfortunately, these natural nutrients are quickly oxidized as the rise through the epidermis, but with the use of Skincerity, they are protected all night long allowing them to work deep in the dermis and help to maintain flawless, soft and supple skin. What about my existing products? You can continue to use whatever products are effective and that work for you. That's another advantage of this amazing product. If you love the skin care you are currently using continue to do so! In fact, with Skincerity, you’ll increase the effectiveness of those products so they work even better. I get emails from Skincerity users sharing the products and regime that they've found work best with Skincerity. I've taken to calling them Recipes because each person has their own way to achieve good results from Skincerity and I value these tried and tested results and feedback. I wanted to share with you so you can see this is not a cookie cutter type of product. You can fine-tune your use and results to suit what works best and to maximize top results for your skin. Check them out to learn from existing Skincerity users on how you can get the best from this amazing product. I welcome your comments on what’s working for you so feel free to email me and I will post them in my Recipe section of this site. Become a distributor today! I already have good skin, what will skincerity do for me? Skincerity will work to keep your skin flawless, helping keep you looking younger longer, but I'll admit it's easier to see the immediate results if you have wrinkles or sun damaged skin. I have been a daily user for over four months and I have seen tremendous results. For my customers, they have had tremendous results and are inspired to continue to use and see improvements. I want to get involved. How do I become an distributor? Skincerity is manufactured by Nucerity International and sold through a network of distributors, like other multi-level marketing companies. We have alot to offer without alot of financial commitments. You can get started for as little as $45 and if you want inventory there are several options to chose from. Here you have choices!